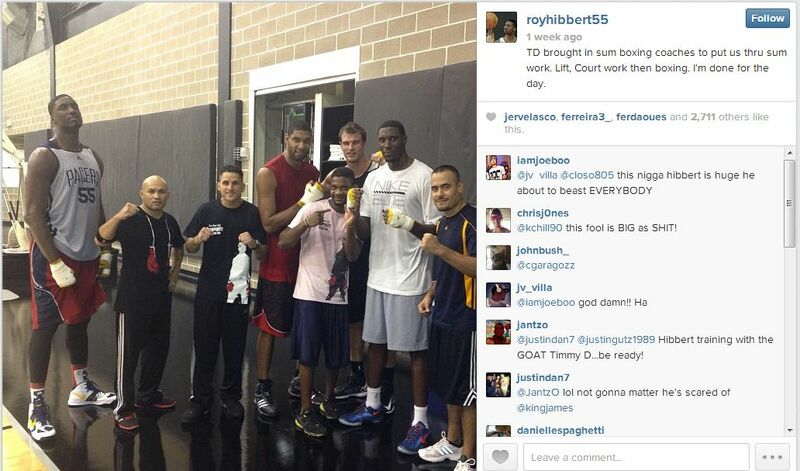 Could Roy Hibbert really block more shots than an entire team? The rest of the league has finally caught up to Roy Hibbert’s blocks. Well, for the most part. Just two weekends ago, Hibbert had 56 blocks in 13 games, good for more than eight teams: Washington (55 blocks), Orlando (54), Minnesota (54), New York (53), Memphis (52), Brooklyn (52), Chicago (47), and Sacramento (34). But Hibbert has been in a “slump” since then, blocking just six shots in his last five games with two of those matchups coming against teams most often rejected: Minnesota and Charlotte. Seven of the eight previously listed teams caught up or surpassed the 7’2” behemoth, leaving only Sacramento behind. The current block score between Hibbert and the Kings: 62-48 in Hibbert’s favor. Can he keep this up for a whole season? Not since 2009 has one player single-handedly blocked more shots than an entire team, when Dwight Howard had 231 to the New York Knicks’ 204, the lowest of any team in NBA history save for the lockout-shortened 1998-99 season, according to Basketball-Reference. That Knicks squad, coached by Mike D’Antoni, played a ton of small ball with David Lee in the middle and Al Harrington at the ‘4’. The same thing also happened to the Knicks of ’08, led by Isiah Thomas where they blocked less shots (213) than Marcus Camby (285) and Josh Smith (227) while going possibly too big with Eddy Curry and Zach Randolph. This year’s Kings fit somewhere in between those two Knicks rosters. They’re neither as mobile up front as D’Antoni’s Knicks nor as large as the Knicks of 2008, but there’s a chance Sacramento is equally as dysfunctional as the two. So there’s that. The Kings just don’t have the personnel up front to be even an average shot-blocking team. DeMarcus Cousins can swat some but he fouls 5.1 times per 36 minutes, and there’s little protection when he’s in foul trouble or needs a breather. Chuck Hayes is an immovable force but that’s for better and for worse, Derrick Williams is like Blake Griffin in the way his athleticism doesn’t translate to blocking shots (and it doesn’t help that he logs time at small forward), Jason Thompson at least looks like he could get up and swat a couple, but his foul rate so far, 6.0 per-36, hasn’t helped and Patrick Patterson, like mostly every other power forward on the Kings, is undersized and a gamble on defense (though offensively he fits in). Some of the lack of blocks can be attributed to the Kings allowing the least amount of shots within the restricted area by a comfortable margin, according to NBA.com, but there has to be a correlation between that and leading the league in fouling. Still, despite opposing teams scoring at will once they’re near the rim (68.4 percent, last in the league), Sacramento’s allowed only 20.1 attempts from there. Second-place Washington has allowed 23.3 attempts while Indiana sits in seventh place at 24.8. And really, the Kings are safe from breaking the ’09 Knicks record for the least amount of blocks in an 82-game season. They’re on pace for 262 which is doable when DeMarcus Cousins, as unpredictable as he can be, has at least been consistently durable throughout his career. An injury (or suspension) to him, though, and things could get interesting. Minnesota also lurks as a possible candidate to be outblocked by Hibbert. There’s not much between a slashing guard and the rim when Kevin Love and Nikola Pekovic are the frontline, but guys like Dante Cunningham, Ronny Turiaf, and Gorgui Dieng are threats in their limited playing time off the bench. Cunningham’s the only player consistently in the rotation, though, while Turiaf is out with a fractured elbow and Dieng has been slow to adjust to the NBA, fouling 7.9 times per-36. The Timberwolves make up for the lack of a rim presence by forcing turnovers and not fouling. When that doesn’t work, though, it’s kind of a really big problem. And some of this weird accomplishment of blocking more shots than an entire team is up to Hibbert, after all. Right now, his foul rate of 3.7 per 36 minutes isn’t an outlier; it’s back down to about where it was in 2012. His blocking frequency is more of a concern. Only 26 times in NBA history has a player blocked eight percent of field goal attempts while on the floor and playing over 70 games, according to Basketball-Reference, the latter necessary should Hibbert block more than Sacramento or Minnesota. That may seem like a realistic rate for an entire season but Manute Bol, Jim McIlvaine, and Shawn Bradley account for over half of those 26 occurrences. That, and only five times has a player had a block rate of eight percent while logging 30 minutes per game. Like DeMarcus Cousins though, Hibbert has been durable throughout his career. And like in the previous paragraph, his foul rate is down which has allowed him to play a couple more minutes per game. Besides, the statistics aren’t that much of an outlier when his work over the off-season got the attention of Grantland, among others. He also dwarfed Tim Duncan, Tiago Splitter, and Ian Mahinmi in one specific, amusing photo. All that hard work is aimed towards helping the Pacers with their journey to a championship, not some weird statistical accomplishment that doesn’t accomplish anything if it doesn’t come with all the little things a great defense like Indiana’s is made of. Maybe the last five games are just variance anyway, balancing out the ridiculous start Hibbert had. We’re still in “SMALL SAMPLE SIZE ALERT!” territory, after all. But if blocking more shots than an entire team comes within the confines of playing great defense, it would be one of multiple ways showing how Hibbert has become a premier force of nature. For more odd accomplishments I hope for this season, check this out.